It was traditional for fashion magazines to show cruise or resort clothes in the dead of winter. Here are all eight “Summer Modes” and their pattern information. Butterick 1828, from January 1928. “A typical southern frock.” Available up to size 44 bust. Soft fabric petals accent one shoulder. Then as now, people who could afford a vacation headed south for a little sunshine during winter months. 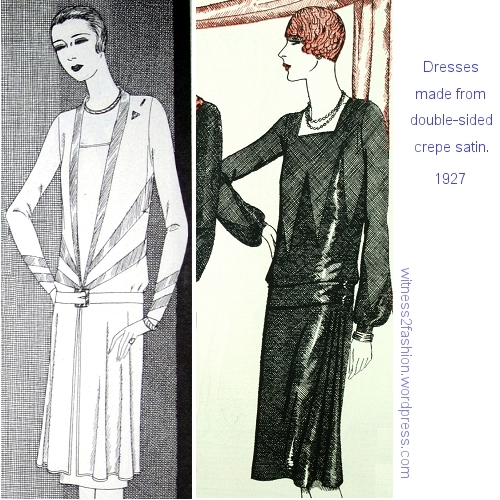 Butterick coat 1821 and frock 1581, January 1928. I love the dress fabric, a pattern of umbrellas and rainbows in falling rain. The sheer coat has a decorative fabric flower on the shoulder. 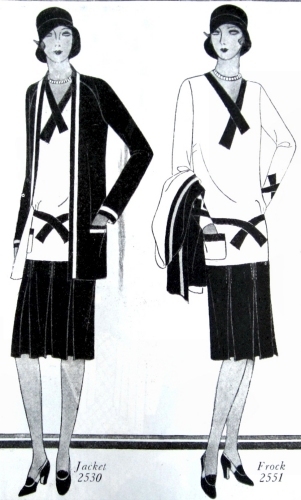 Butterick 1824, a spectator sports outfit from January 1928. This cardigan costume — with velvet sleeveless cardigan — has two color bands at hip and wrist, the lighter band matching the cardigan vest’s color. Butterick 1818 from January 1928. Sheer georgette chiffon in a floral print worn over a light colored slip, probably the same color as the “plain Georgette” which trims the neck and forms a long bow. Four outfits featured on the bottom of page 33. Delineator, January 1928. Butterick 1819, a coat illustrated in a boldly patterned striped shantung silk. It is also shown sleeveless. The dress barely covers the kneecap, and the 7/8 length coat suits it perfectly. I love this silk coat. I think it is meant to be worn open, and is not for warmth, but I like the deep triangular pockets and that fabric! I hope it really existed and was not the illustrator’s invention. Jean Patou had popularized monogrammed sports wear (his own monogram on couture) in the early twenties, and many stylized alphabets were available as embroidery patterns. Butterick 1816, a sports frock from January 1928. Stylized monograms were quite popular, so that may be an “M” embroidered in thread to match the striped neckline and belt. The box pleats are applied on top of the belt. By a happy coincidence, The Midvale Cottage blog just shared illustrated sewing instructions by Ruth Wyeth Spears for sewing exactly this type of pointed 1920’s pleat. Click here. 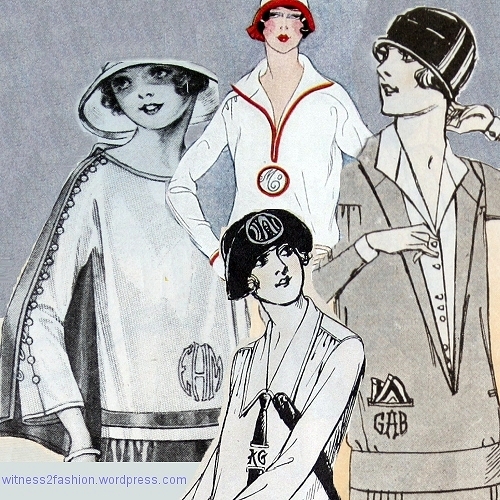 Butterick 1822, a three piece sport ensemble from January 1928. It is not a knit fabric, but Shantung. The blouse has a bold sun ray applique. So, that’s one cardigan made of velveteen and one made from silk Shantung. Without the pattern descriptions, I would have assumed they were jersey knits. Butterick party frock 1826, from January 1928. It could also be made with long sleeves, and the pattern was available for teens or small women, and for women up to size 44 bust. Notice the ruching at the shoulder, which creates a little fullness for the bust. The pattern for the slip that goes under the sheer chiffon Georgette was not mentioned. 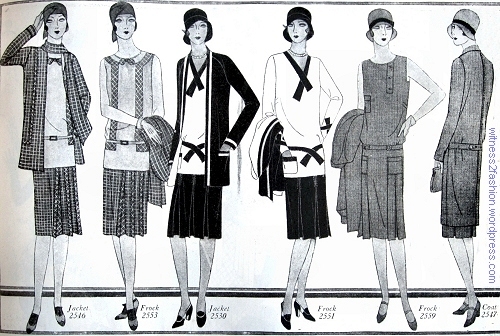 We think of the twenties as the era of the slim, boyish figure, but all eight of these Butterick patterns were available in sizes up to 44 inches bust measurement, hip 47 inches. Patterns for October Brides. Delineator, October 1925. The classic 1920’s roses embroidered on this simple beaded dress show both luxury in ornamentation and simplicity in style. It is just one of seven October wedding dresses from Butterick, including one recommended for very young brides, and one that was available up to size 48 bust. Butterick patterns 6362 and 6360, Delineator, October 1925, pg. 32. Butterick 6362, October 1925. Made in colored fabric, this pattern would serve as an afternoon or evening dress. In illustrations, it’s not always easy to distinguish between a line of beads or a line of topstitching. The zigzag edges of No. 6362 are probably an indication of picot edging, a typical 1920’s hem for chiffon. Spaced beads were sometimes used, but their weight would affect the hang of the draped panels. You can see a picot edge on the collar, and spaced beading on the edge of a side panel on the blouse of this suit, circa 1917. Thanks to B. Murray for permission to photograph. Butterick wedding dress No. 6360, October 1925. The sheer sleeves may be removed and the armhole cut down to make an evening dress after the wedding. This pattern was available up to size 48 inches bust measurement. Wedding gowns from Butterick patterns 6224, 6175, and 6146. October 1925, Delineator. They are as short as ordinary day dresses. Butterick 6224, with embroidery transfer 10285 for the rose worked in pearls on a satin or silk crepe dress. Delineator, Oct. 1925. Wedding dress No. 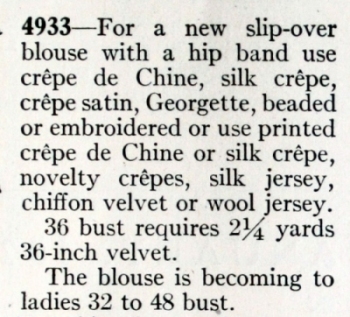 6175, Butterick, Oct. 1925, Delineator pg. 34. Her bouquet looks like a dead fox, but I like the subtle beading (?) around the top and seams of the lace flounce. Wedding dress No. 6146, Butterick pattern; Delineator, October 1925. Butterick 6349 was for a “very young bride” (or a small woman), and only available in sizes 15 to 20 years. Even in satin, it looks rather sporty! Click to see the pattern envelope illustrations– which do not suggest that it is a wedding dress. The veils range from clouds of tulle to a lace mantilla, from a headband to a tiara. Bridal veils and wedding headdresses, Delineator, October 1925. Wedding pattern 6227, Butterick, October 1925. Butterick Bridal Gown 6227, Delineator, Oct. 1925, pg. 34. An all-over pattern of stylized roses — “work in beads” — might be a mother’s labor of love…. In an alternate view, No. 6227 has long, sheer sleeves, tied at the wrist, and a wider hip sash. Back and alternate views, Butterick 6360, 6175, 6227, 6145, from 1925. Back and alternate views, Butterick 6349, 6224, 6362, from 1925. 6362 has quite a pretty back, while most of the other wedding dresses depend on their veils for back interest. Top of page 34, Delineator, August 1928. Several print or textured dresses. Top of page 35, Delineator, August, 1928. Print and textured fabric dresses, including knits. Left, Mallinson’s “brown satin crepe, printed on the crepe side, plain on the satin side;” shown in Butterick pattern 2129, below left. Right, “wine red canton crepe” made by Stehli, with the glint of gold tinsel thread all through it; used in Butterick pattern 2117, below right. 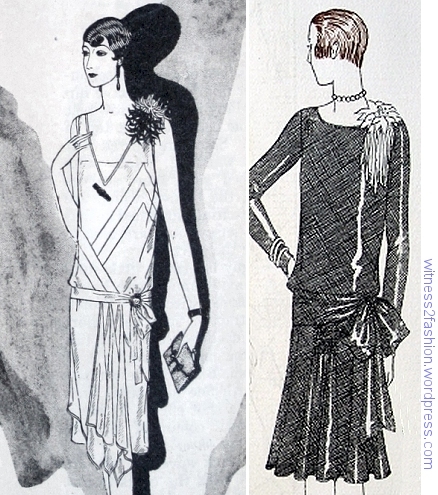 Butterick patterns 2129 and 2117, Delineator, Aug. 1928, p. 34. The dress on the right has metallic threads forming the pattern. Transparent rayon velvet fabric made by Blumenthal, in a floral print. Aug. 1928. “Transparent rayon velvet with the colors and flowered design usually associated with chiffon,” was used for a surplice dress, Butterick 2166, below left. Crepe satin was used for Butterick 2178, below right. Butterick patterns 2166 and 2178. Delineator, August 1928, p. 34. 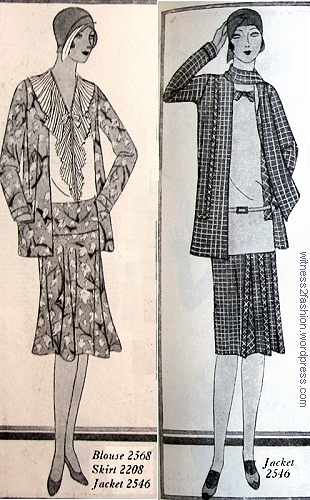 Two Botany fabrics for Fall of 1928. Left, “checked grege and brown tweed,” used for Butterick 2154, below left. On the right, a “selvedge-bordered fabric” used for Butterick No. 2164, below right. 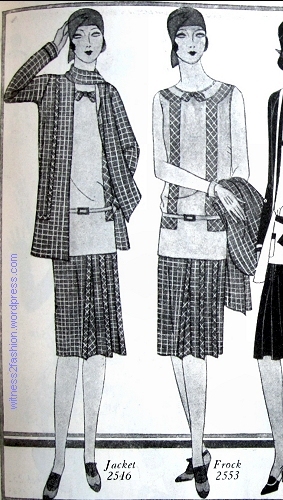 Butterick patterns 2154 and 2164, Delineator, August 1928, p. 34. Forstmann’s tweed kasha fabric for a coat. 1928. 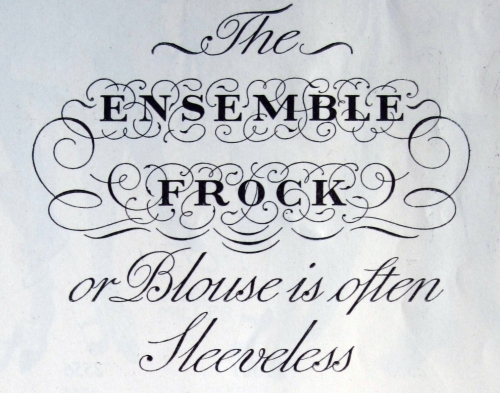 On the facing page, p. 35, more Fall fashions — and fabrics — were illustrated. Printed wool fabric from Botany, left; and a photo-printed (?) jersey fabric from Wyner. Delineator, 1928. The fabric swatch on the left is printed kasha, used for Butterick 2162, below left. The geometric pattern on the swatch is turned ninety degrees from the way it is shown in the dress. 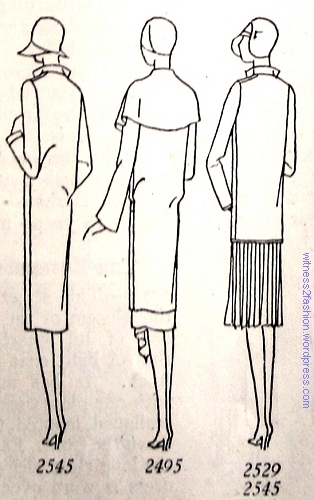 Below right, “jersey, printed with a photographed tweed design of brown on beige,” illustrated on a simple V-necked dress, Butterick 2182. Print dresses made with Butterick patterns 2162 and 2182. Delineator, Aug. 1928, p. 35. (Twenties’ dresses don’t get much simpler than this jersey knit one. Thank Mlle Chanel.) This pattern was available up to size 52 inches! 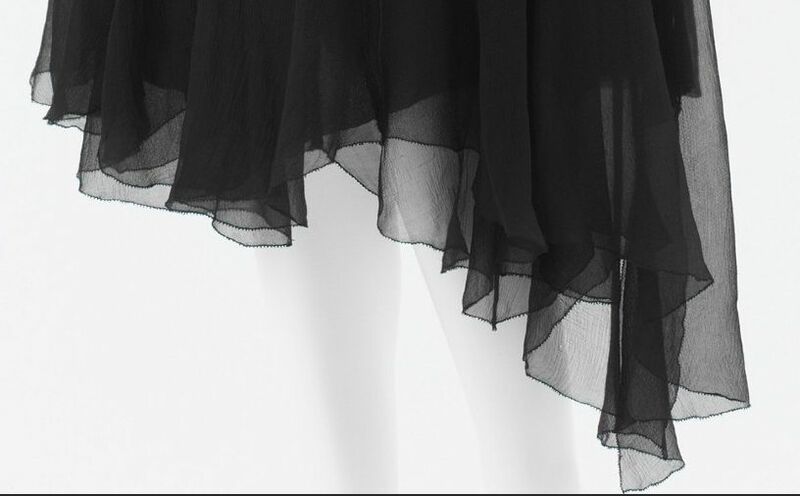 Below left, “black barre satin, a material that is cross-barred with satin lines on the dull surface, dull lines on the satin surface. (I had to enhance the photo to show that there is a subtle pattern in the dark material.) The double-faced satin was used in Butterick 2119. Below right, a rayon knit top with an ombre pattern in gray and white, over a plain gray skirt. Butterick pattern 2180. Black barre satin made by Schwarzenback Huber (left), and an ombre printed knit rayon from American Rayon Products. 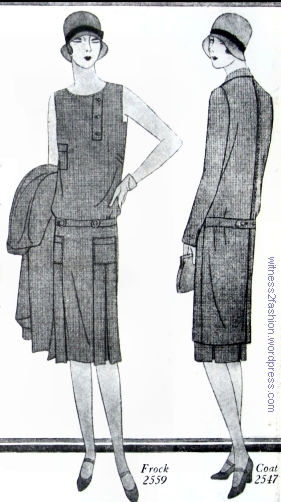 Butterick patterns 2119 and 2180, Delineator, Aug. 1928, p. 35. 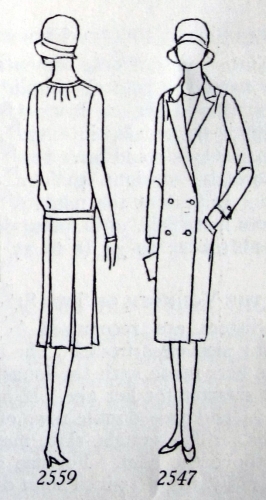 A silk crepe dress (Butterick 2170) [fabric not illustrated] called for a coordinating wool coat made from gray-beige wool threaded with dark brown (Forstmann fabric, below right.) Left, a printed wool and rayon blend “with modernistic cross-hatch design in natural, beige and grege tones,” shown in Butterick dress 2184. Left, a cross-hatched printed wool and rayon fabric from Bianchini Ferier, and right, Forstmann gray-beige coating with fine brown threads. Butterick patterns 2170 and 2184. Delineator, Aug. 1928, p. 35. Geometric print dresses to wear to an exhibit of Cubist paintings? Click here for characteristic examples by Braque and Picasso which may have influenced these 1920’s textile designs. Even the tan/gray/beige color palette is similar. Did Cubist art influence these textiles? Helen Dryden, who illustrated the cover of this August issue, painted stylized flowers like a dress fabric in the background. 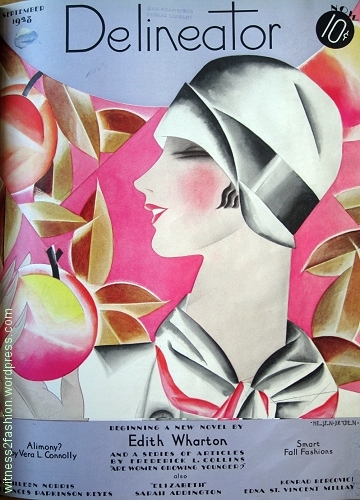 Helen Dryden’s illustration for cover of Delineator, August 1928. Dryden illustrated many color advertisements for fabrics.) 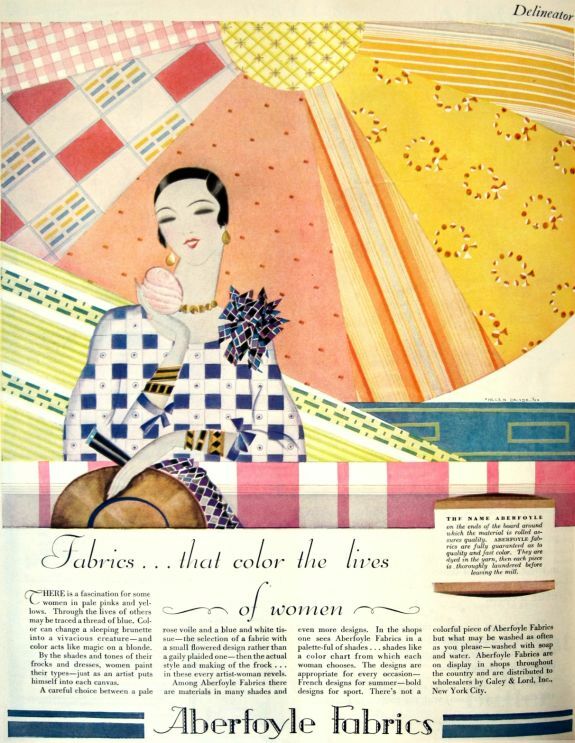 The Vintage Traveler wrote more about Dryden’s Art Deco ads for the Aberfoyle Textile Mill. Click here. 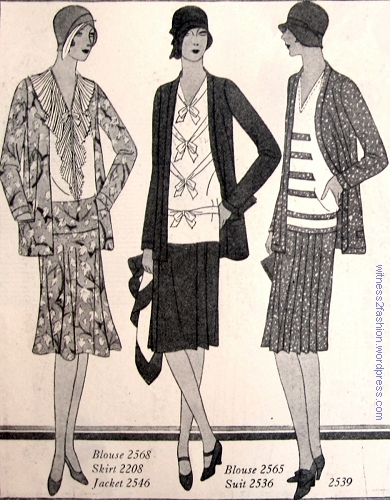 Spring jacket and coat ensembles; Butterick patterns from The Delineator magazine, p. 35, April 1929. There is a time machine in San Francisco. Every year, thanks to the SF Silent Film Festival, I enter the Castro Theatre, a 1400 seat “movie palace” built in 1922, and spend several days watching movies from the 1920’s, (and earlier) in the building where they originally played. Unlike so many of its peers, the Castro has not been divided into tiny screening rooms with the seats not-quite-facing the screen. Here, silent movies are shown on a full-sized, correctly proportioned screen, not chopped and cropped, letterboxed, or panned-and-scanned to fit a TV screen or modern movie proportions. They are accompanied by live music, just as they were in the 1920s. I enjoy my time travel with thousands of like-minded people, a number of whom dress in vintage or replica 1920’s clothes. 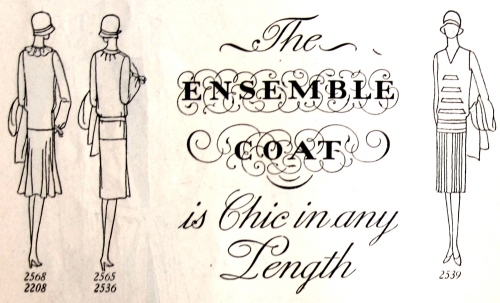 In honor of The SF Silent Film Society, (you can scroll through their archives here) I’m sharing some suit, coat, dress and jacket ensembles ideal for an afternoon matinee in 1929. 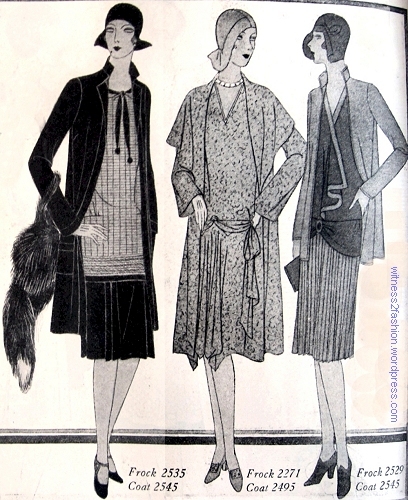 Ensembles for Spring, 1929. The Delineator, page 34. The Delineator, April 1929, p. 34. Left, blouse #2568, skirt # 2208, jacket # 2546. Center, blouse #2565 with suit #2536. Right, frock and jacket ensemble # 2539. Butterick patterns, April 1929. 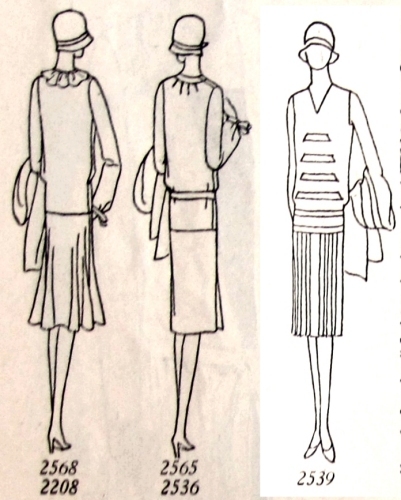 The skirt on the left is worn over its blouse; in the center, a blouse is worn over a skirt. The bands of trim on #2539’s dress form a triangular shape. This sleeveless dress has the new, square armholes. Alternate views of blouse #2568 & skirt #2208, blouse #2565 & suit #2536, and dress #2539. 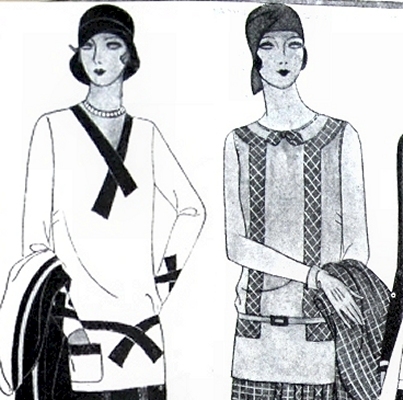 Butterick patterns from 1929. Left, frock #2535 with coat #2545. Center, frock #2271 with coat #2495. Right, coat # 2545 again with frock #2539. 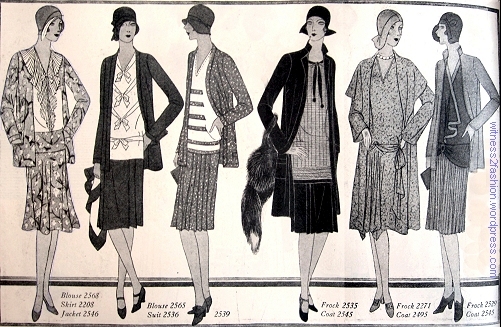 Butterick patterns from 1929. Coat # 2545 is shown at left in seven-eighths length over a two-piece dress which uses a border print for its very long top. At right, the same coat (#2545) is shown in jacket length. Both have standing collars. The coat in the middle, with “a youthfully wide collar,” reminds me of one I owned in the 1980’s, made of reversible material. Alternate views of coat #2545, coat #2495, and dress #2529 with coat #2545 as its jacket. Jacket #2546 and frock (dress) #2553. Butterick, April 1929. Back views of jacket #2546 and dress #2553. Butterick, 1929. On the jacket “the bands and the scarf collar may be omitted.” In fact, this is the same jacket shown earlier, when it was made from printed fabric and worn with a matching print skirt and a ruffled blouse. This high-contrast dress and jacket ensemble looks great in black (or navy?) and white, but Butterick suggested a different color combination. Jacket #2530 worn with Frock #2551. Butterick, 1929. Alternate views of #2530 and #2551. This jacket is longer than the others. Butterick dress pattern #2559 and coat pattern #2547. 1929. I almost think you could wear this frock today (adjusted to normal body proportions) without people realizing it was a vintage dress. It has square armholes, as well as square pockets. Alternate views, dress #2559 and reefer coat #2547, shown full length. Butterick, 1929. The “Reefer Top-Coat,” #2547, “is a fashion classic — double-breasted with a belt and vent in the back — but it is in the new seven-eighths length. In navy or white cheviot with brass buttons, it becomes the nautical reefer that is worn aboard ship by the smart yachtswoman. At Palm Beach it was worn for sports.” — The Delineator. Speaking of normal proportions: on all the dresses that are not covered by jackets, there are two shallow bust darts on each side. Their location is rather low by modern standards, perhaps because the torso is very elongated in these illustrations. 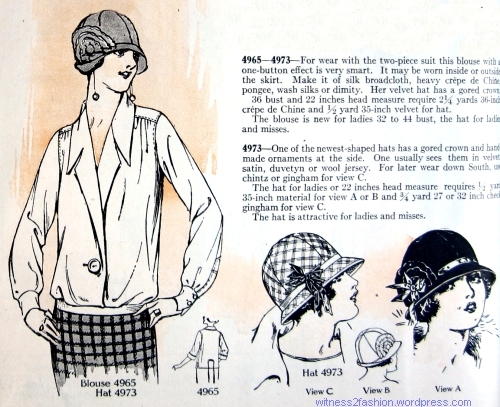 Also worth noting: most of these cloche hats for Spring of 1929 have very little brim in front — if any. 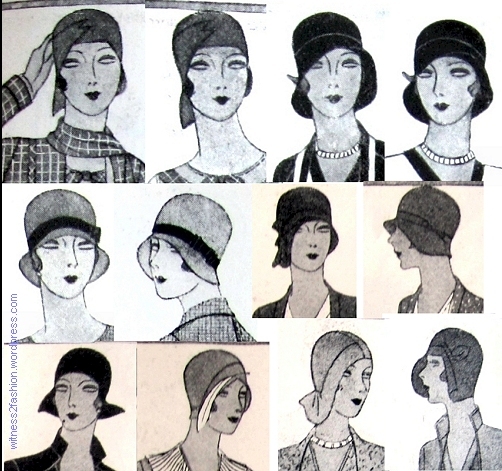 Cloche hats for April, 1929. The Delineator, pp. 34-35. This year, the Silent Film Festival in San Francisco runs from Friday, May 28, through Monday, June 1. Buying tickets in advance is a very good idea — for many movies, all 1400 seats sell out. It’s possible to see four or five different films in a day. This year, the time machine will go back 99 years to 1916, showing William Gillette as Sherlock Holmes, plus the silent “Ben-Hur”(1925) and “All Quiet on the Western Front” (1930), Greta Garbo (1926), Harold Lloyd (1928), Colleen Moore (1929), and silent films from Germany, France, Norway, China, the U.K., and of course, the U.S.
Also, the “High Style” exhibition from the Brooklyn Museum Collection at the Metropolitan Museum will be in San Francisco until mid-July. What a great summer! 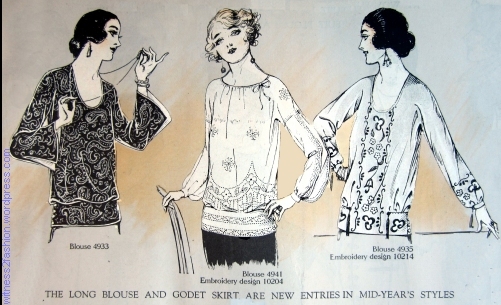 Butterick blouse patterns from Delineator magazine, January 1924. 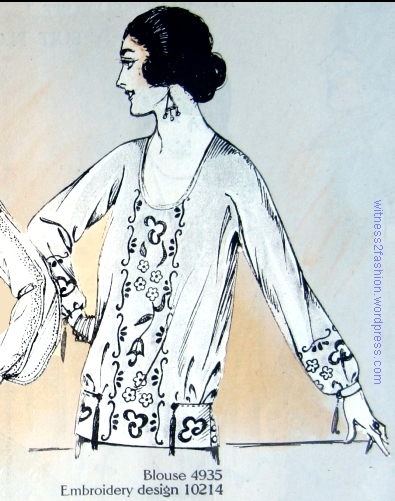 Butterick blouse pattern 4933, Delineator, January 1924. Like the other blouses in this illustration, it buttons at the hip band. Imagine how fabulous — and relatively easy — this would be in printed velvet, as shown. 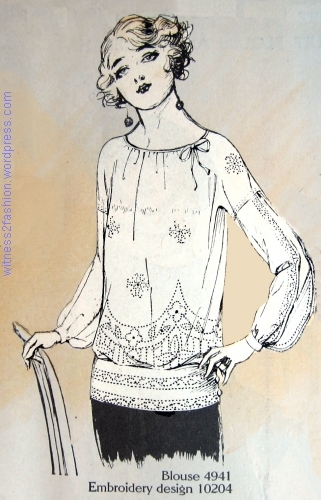 Butterick blouse pattern 4941, Delineator, January 1924. Butterick sold embroidery transfers and beading patterns as well as sewing patterns. To see a vintage early 1920s blouse, embroidered and beaded on sheer fabric, click here. Butterick pattern 4935, Delineator, January 1924. Two of those blouse patterns were available in larger-than-average sizes. 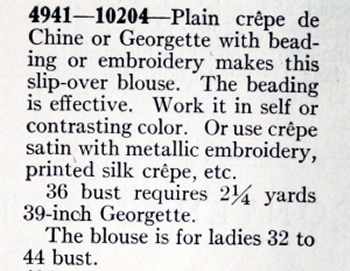 (The normal range of Butterick patterns in the 1920’s fit bust sizes 32 to 44 inches.) 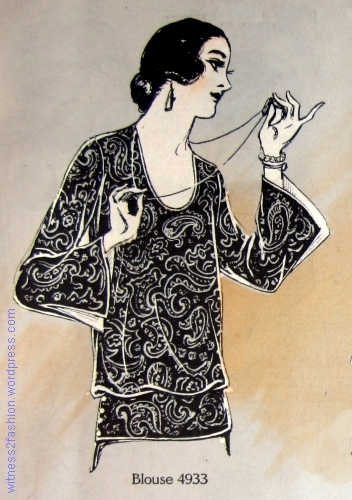 To see more embroidered garments from the 1920s, click here. 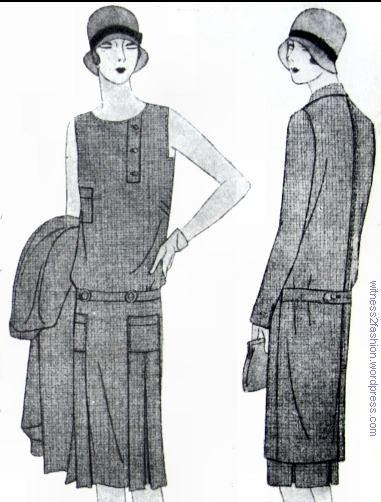 Butterick blouse pattern 4965 and Butterick hat pattern 4973, Delineator, January 1924. Butterick’s cloche hat pattern No. 4973, for Ladies or Misses. Delineator, January 1924. “One of the newest-shaped hats has a gored crown and hand-made ornaments at the side. One usually sees them in velvet, satin, duvetyn [a brushed wool] or wool jersey. For later wear down South, use chintz or gingham for view C. . . . The hat is attractive for Ladies or Misses.” I never thought of a chintz hat as a twenties’ authentic style, but here it is suggested by the Butterick Publishing Company. Although Butterick sold many children’s hat patterns, hat pattern No. 4973 is not for children — even when made from chintz or gingham. Cloche hat trimmed with a gathered self-fabric cockade, probably bound in ribbon or bias-cut silk. 1924. 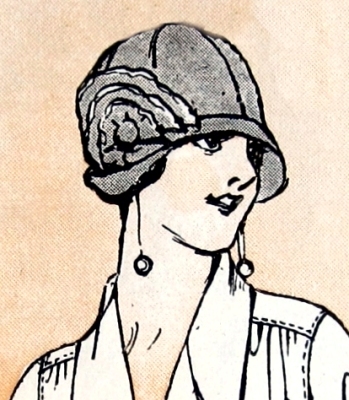 You can see more 1920’s hat patterns and hat trims by clicking here.